The seven feasts in three times in 2018 began in the evening of March 30 (the 14th day of the first month by the sacred calendar), with the sacred assembly of the Passover. In 2018, the 100th anniversary year of the birth of Christ Ahnsahnghong, who restored the new covenant truth according to the prophecies of the Bible, the members of 7,000 Churches of Gods in 175 countries around the world participated in the feast, sincerely giving thanks to Christ who sacrificed Himself for many years until He restored the truth of life. In the special year of 2018 that marks the 100th anniversary of the birth of Christ Ahnsahnghong, who restored the new covenant and rebuilt the Church of God which had disappeared from history, the General Assembly was held at the Okcheon Go&Come Training Institute in Korea. 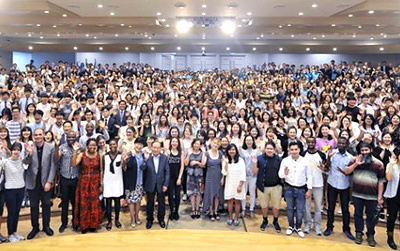 On March 4, the Semester Opening Service for University Students 2018 was held at the New Jerusalem Pangyo Temple in Korea to sow faith and courage in the hearts of students who strive to achieve their dreams, shuttling between libraries and lecture rooms every day. The dedication services for the Hyeongok Church in Gyeongju and the Jinyeong Church in Gimhae were held on February 19 and 21, 2018. On February 7, 2018, the Church of God received a group citation from the Minister of Interior and Security at the Citation Ceremony for Earthquake Response Volunteers held at the Pohang City Hall in Korea. It was presented in recognition of the church’s volunteer services for more than sixty days for the earthquake victims in Pohang. The 100th Anniversary of Christ Ahnsahnghong’s Birth Celebration was held at the Go&Come Training Institute in Korea on January 14, 2018. Christ Ahnsahnghong established the Church of God. New Jerusalem Cultural Contents Awards Ceremony 2017 was held at New Jerusalem Pangyo Temple in Korea on December 10. It is an integrated awards ceremony of the 18th Melchizedek Literary Awards, the 3rd Elohim Video Festival Awards, and the 3rd Bible Seminar Presentation Awards. 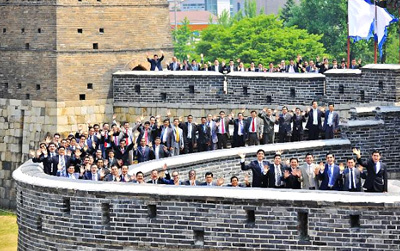 At the time of finishing the year and preparing for the upcoming New Year, there was a meaningful event to make a hopeful future with the world. That is ASEZ Global Forum 2017 on the Implementation of UN SDGs held on December 7 at the New Jerusalem Pangyo Temple. It is autumn, the harvest season when all kinds of grains and fruits ripe. The last three feasts—the Feast of Trumpets, the Day of Atonement, and the Feast of Tabernacles, so-called “autumn feasts,” among God-established seven feasts in three times, are also the season when God’s abundant blessings and the gospel fruits are reserved. The Church of God members around the world kept the feasts godly, hoping to harvest many fruits of the gospel, clothed with God-given grace of the forgiveness of sins and with the power of the Holy Spirit. 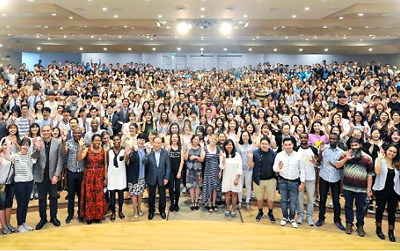 Before the autumn feasts that begin with the Feast of Trumpets, three dedication services were held in Korea: the Heungdeok Church and the Seowon Church in Cheongju (Sept. 12, 2017), and the Sangdaewon Church in Seongnam (Sept. 16).